Debbie and her young cheerleader friends, portrayed by the freshest new faces on the X-Rated screen, are faced with a dilemma. 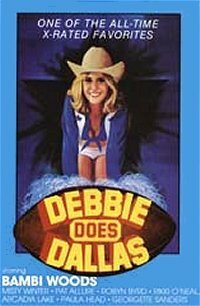 Debbie's vibrant sensuality has earned her a coveted place with the Texas Cowgirl Cheerleaders. A trip to Dallas is expensive however, and College students don't often have that kind of money. As the action moves to the showers, a plan is formed. The eight dazzling cheerleaders will all go to Dallas and to afford it, they have formed Team Services, an organization dedicated to serving their clients with total satisfaction.... for a price. Profits roll in, but it is Debbie who really saves the day. Her magnigicent young figure clad in full cowgirl regalia is the embodiment of every male's fantasy. To keep the illusion perfect, Mr. Green felt prioprietor of the local sporting goods store, dons his old football uniforms and indulges in his most carnal fantasies. As the part of Debbie is played by the increcible Bambi Woods, the movie is one of the hottest X-rated films ever made. This feature is rated X and is only for viewers over 18 years of age.